‘GWS’ Gansow water management system increases the productivity of the scrubber drier up to 50% over other machines due to the water delivery system and clever brush design which holds the clean water for longer. Claim back the cost of this machine against taxable profits! The IPC Gansow 61 BF 68 is listed on the governments Water Technology List (WTL) promoting the use of sustainable products through the Enhanced Capital Allowance (ECA) scheme. The ECA scheme allows UK businesses to write off the whole cost of the equipment against taxable profits in the year of purchase. This can provide a cash flow boost while investing in sustainable water products. The IPC GP 1/16 Wet & Dry vacuum is compact, lightweight and robust featuring a 1300w motor, 16L tub capacity and an airflow of 55 L/sec. As with other IPC Soteco vacuums the GP 1/16 features the Sanifilter antibacterial treatment. The Sanifilter inhibits and eliminates bacteria, fungous, viruses and mico parasites preventing airborne hazards. When used in conjunction with the dust bags the Sanifilter gives extra protection for people suffering allergies. Complete with a 36mm wet & dry tool kit and on-board tool storage. With a 1300w by-pass motor and 27L capacity the IPC GP 1/27 is a high performance compact wet & dry vacuum. Featuring on-board tool storage, anti-bacterial Sanifilter and full 36mm wet & dry tool kit. The GP 1/27 has an ergonomic carry handle, large cable hook and the anti-foam filter for added motor protection. The IPC GS 1/33 is a lightweight commercial wet & dry vacuum. Featuring a 1300w by-pass motor, 33L stainless steel container and on-board tool storage. With ergonomic carry handle, large cable hook and the anti-bacterial Sanifilter. The GS 1/33 comes complete with a full 36mm wet & dry tool kit including the anti-tear Soteco hose. The IPC Gansow CT40 C 50 mains powered scrubber drier. Featuring a 40 litre solution tank and 50cm scrubbing width this machine is capable of cleaning 1,750m²/h. All the models in the IPC range are constructed from high density polyethylene, use high quality and performance vacuum motors and require no tools for changing both brushes and squeegee blades. The CT40 features an easy to use control panel with level sensors on both tanks, individual brush and vacuum control as well as an emergency cut off switch. Available with either 20 or 30 metres of cable. 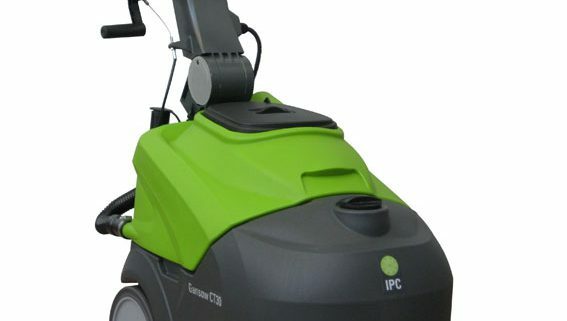 The IPC Gansow CT40 BT50 ECS pushes the boundaries of efficient floor cleaning. Featuring the patented Micro Scrub system, the ECS models use Microfiber pads at high speed to clean the floor with the smallest amounts of water and chemical. As Microfiber’s are proven to clean with brilliant results on all smooth floors the CT40 BT50 ECS is perfect for companies looking to save water bills, and claim back the cost of the machine against taxable profits with the ECA. Featuring a 40L solution tank, 50cm scrubbing width and the Chem Dose (Chemical dosing kit) as standard. Claim back the cost of this machine against taxable profits! The IPC Gansow CT40 BT50 ECS is listed on the governments Water Technology List (WTL) promoting the use of sustainable products through the Enhanced Capital Allowance (ECA) scheme. The ECA scheme allows UK businesses to write off the whole cost of the equipment against taxable profits in the year of purchase. This can provide a cash flow boost while investing in sustainable water products. The IPC Gansow CT30 C mains powered scrubber drier has been designed around the smaller CT15 however has larger tank capacity and upgraded motors. The all new design of the CT30 allows a larger tank capacity of 30lt to fit into a compact machine without compromising on any performance. The smart design of the solution tanks allows for increased capacity, increasing working time and performance while still being small enough to fit in the cleaning cupboard. The CT30 features a smart new curved squeegee bar that fits behind the brush to collect water and dirt without leaving water in the turns. The control panel is easy to use with one touch button control, height adjustable handle and tool-less removal of brush and squeegee blades. 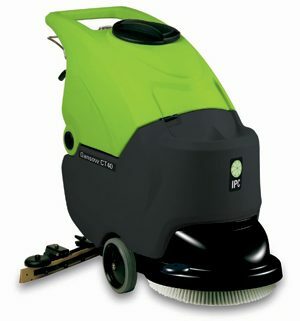 The new IPC Gansow CT15 C35 R mains powered roller brush scrubber drier will clean both hard floors and carpets by simply changing the squeegee blades. Designed to clean all floor types including smooth vinyl, Altro non-slip and tiles the roller brush gives the deepest clean yet for a machine of its size. Featuring a 15L solution tank and 35cm cleaning width the CT15 B35 R can clean up to 1,300m²/h and has 15m of cable. Carpet Cleaning – Simply change the suction squeegee bar to the carpet plates and the CT15 C35 R becomes a fully functional carpet cleaner. There is also the option to add an external hose and wand for hard to reach areas. The CT15 C35 R is the perfect machine for smaller areas of flooring whether they are rough, uneven or smooth. With twin squeegee blades both front and back of the roller brush you can collect the water in forwards and reverse. The IPC Gansow Tiger 500 electric vehicle has an unlimited range of applications with over 25 specialist accessories and attachments. The Tiger 500 is the mid level model with a towing capacity of 270Kg and a maximum climb angle of 12%. The Tiger 500 has a 4 hour battery run time so is perfect for longer use throughout the day. If longer run times are required the Tiger 1000 has a 6 hour battery life. With its silent operation the Tiger 500 is perfect for use in quiet areas including hospitals, airports and shopping centres for moving heavy objects. With an adaptable towing hook the Tiger 500 can be matched to any trolley system or pallet truck allowing the operator to complete tasks faster.